Many people call the iPhone the Jesus Phone. The title is a bit lofty but I do understand why iPhone fanatics are zealous about their favorite device. It really does a lot of things and it does it quite well. Take for example its ability to shoot photos and videos. I know of people who have chucked their point and shoot cameras in favor of their iPhone. It makes sense really because you bring your phone everywhere with you but you have to remind yourself to bring your camera. But there’s one drawback to using the iPhone as a camera – it still doesn’t have some of the features that we’ve become accustomed to in P&S cameras. But there’s a way around it. 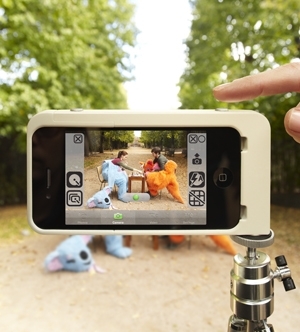 The Kapok Case brings functionalities of a point and shoot to your iPhone and it does it effortlessly. Canopy, the maker of the Kapok Case has designed to this case to integrate with the iPhone. It actually interfaces with the iPhone’s dock connector, which allows it to add more features to the usual photo taking functions of the iPhone – all this in one case that actually protects your phone as well. The Kapok Case has two dedicated shutter buttons. The buttons allow you to half press (just like in a P&S) to focus on your subject and also to set the auto exposure settings. This is a feature that the iPhone really needs and it’s wonderful that Canopy has actually thought of this product. But Canopy doesn’t end their innovations here. There is also a free Canopy Camera Tools app that allows you to use the second shutter button to take stills while your actually recording videos on the iPhone. The Kapok Case by Canopy can now be pre-ordered and it will retail for $69.95.